When do we learn the most? This is the start of our 5th day without power resulting from the ice storm. Experts say we haven't had a storm like this with such widespread damages in over 35 years, but that doesn't mean we are out of the hot seat on global warming. In years past, in a storm of this kind we would have had heavy snow with less destructive effect on the forests. Over 900 utility poles in the region were broken by the storm and it will take some time to put things back. During the storm we saw blue flashes from the transformers burning out. Between poles and transformers the work facing our utility providers is daunting. Power is supposed to be restored to the city of Eureka Springs by Sunday night, but here in the woods outside the city limits, we know things may take longer. We missed 4 days of school last week, but with the knowledge that we learn the most from difficulties, not when things are made easy for us. Going without power and making do with a simpler life is a challenge. We learn so much more about ourselves when we can no longer hide in the latest attention grabbing gizmo, when the shop, too is without power, and when the simple things of keeping clean, warm and fed require much greater effort. To make things easy for our children is a natural parental inclination that must be fought in order to raise healthy and competent children. Lately I've been reading about "Will", an educational concept that was more commonly used in the late 19th century and is still used today in Waldorf education. I will try to offer some suggestions on the concept of will later when I have a more reliable internet connection. But for now, I can tell you that will is the thing that suffers when things are made easy and children are led to believe that taking the easy way out is acceptable for them. In order to build a meaningful life, will is the thing that drives effort, and meaning is what arises when we have worked hard for something. It is tragic when children due to laziness and lack of vision and challenge fail to deliver meaningful service to the lives of others and harvest its wealth for themselves. One of the great things about Arkansas is that we often get real winters, snow and ice, but instead of snow staying on the ground all winter, we also get periods of relative warmth and very sunny days. Tomorrow the temperature will climb almost to 60 degrees. And the sun will accomplish more in one day than I've been able in the last three to remove the ice from our long drive. I spent 3 sessions today chipping away at the ice on the Carnegie Library steps. Steps were an architectural feature of almost all Carnegie Libraries, as Andrew Carnegie believed that climbing steps was symbolic of the efforts required for self-improvement and education. Tell that to the elderly and the Americans with Disabilities Act. About 20 years ago, as my wife was pregnant with my daughter, Lucy, she spearheaded a drive to put in an elevator, which required over a month of jack-hammering from the solid limestone bluff to make room for it. Tomorrow the library will be open for limited hours since the power is still not on in most of Eureka Springs. We are on our 4th night without power and as yet have no idea how long it will take for power to be restored. I have just a few minutes before the laptop runs out of juice again. I can recharge a bit when I go out in the car. The top photo is looking south toward town and the lower is of damage to a redbud tree. Almost all of Eureka Springs remains without power. But thanks to our wood stove, an abundant supply of firewood, and good friends in the same boat, we are doing quite well. Friends in town are helping each other, and it seems we see the best of human nature come to the surface when times are challenging. It kind of tells the process that allowed Americans to weather the great depression, and tells how strong we will be as we work through the world-wide economic challenges. We are now ready for our third night without power and it may still be a matter of days before power is restored. We went to a friend's house to bathe, and being clean is one of those things we in the western world take pleasure in. Today we began working on the library steps, removing ice, but there is still no power in most of town, so there is no real hurry. The library probably won't be open tomorrow. I have lost the week of school. The most interesting thing is going to bed so dog-goned early each night. You can only do so much reading by candle light. You may have seen reports about Northwest Arkansas in the news. The reports are true. The power outage is wide spread. My wife is the best person in the world to be snowed in with, and while we worry about the elderly, and those at home alone, we know we are living history. 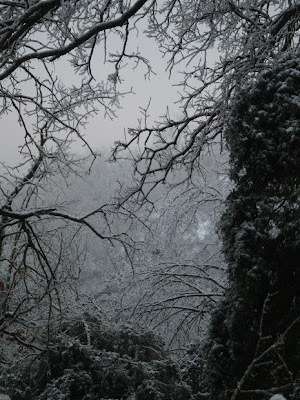 This is the worst ice storm on record for Eureka Springs. The damage is widespread, but our home is safe and warm, and we are, too. At one time throughout Scandinavia, where the nights can be so long, people kept active during the winter months making things. The native crafts of Sweden are called Hem Sloyd, or home craft. And today the HemSloyd organization in Sweden is very much like the American Craft Council in the US, advocating a resurgence of craftsmanship. I keep thinking, maybe instead of going to bed so early, or trying to read by flashlight, some carving might be in order. If only I could do it without leaving so many wood chips behind. The interesting thing about Hemsloyd was that not only did it provide a means of making extra income, by making beautiful things, it provided a sense of well-being despite the darkest and coldest nights. But then today, most people would rather watch television and take anti-depressants. I am very sorry for what they are missing. 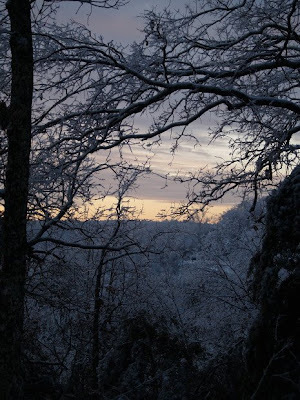 The photo above was taken this morning out the back our our house, looking into the frosty forests of Arkansas. 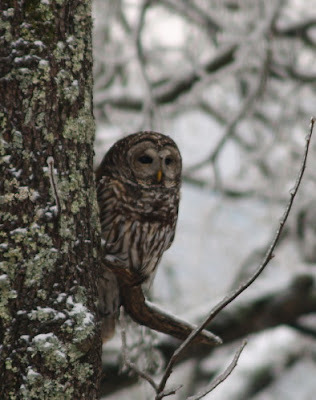 It was a pleasure today to come face to face with my barred owl friend, and for him (or her) to have sat still long enough for me to get photos that I could share with you.. During the spring, summer and fall, I hear him each afternoon. His most distinctive call is like this: “Who cooks for you. Who cooks for you. Who cooks for you-allll.” His nest is only a few yards from the back of my house. I have seen his quiet flight, wings retreating quickly through the woods. But this is the first time I have seen him still. I know there are those who have no connection with the outdoors. I have heard that some people don’t even like it. Too many bugs and other unexpected, undesirable elements of intolerable reality. I feel a sense of tragedy for them, for what they miss, but I feel a sense of tragedy also for the wild things that come to harm through the thoughtlessness of those whose rightful place should be to protect. I worry that democracy is harmful to everyday reality. How can we entrust wilderness to the care of those who have so little understanding for it? It presents a challenge. We must get kids into the woods and take time ourselves to observe the wonders. This is what the forests look like in Northwest Arkansas... in every direction. I drove through town after getting our road cleared of limbs and downed trees, and the downed trees have roads blocked and the power shut down throughout the city of Eureka Springs. It may take several days for power to be restored. We are without power due to the ice storm her in Arkansas. I managed to chain saw and trim the downed limbs and trees from our gravel road, so we can get in or out when the inclination hits. I still have a bit of life in the laptop. 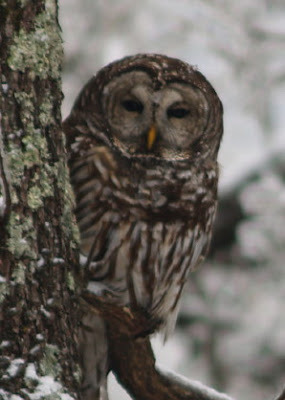 This morning I saw the barred owl that lives in the wood below the house. Normally, due to the speed of life, I might not have noticed. With electric power, we ourselves take on a faster pace. He stands about a foot tall, but with a wing span of 3 feet or more. They fly with complete silence, but I have been hearing his (or her) call from the woods for a couple years now, and have wondered when I would get a glimpse. 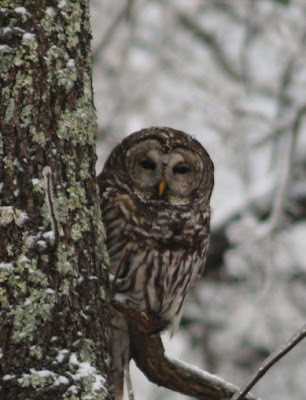 The ice storm will be very good for owls. The many trees broken off by the ice will make great homes in the coming years. And today is a great day for walk in the woods. It is like standing in a crystal cathedral and when the sun comes out we will find ourselves in a blaze of light. We are in the midst of an ice storm in Northwest Arkansas, so I am writing this on laptop and with wireless modem. Our power went out hours ago, so we had dinner made by candlelight and it may be an early night. 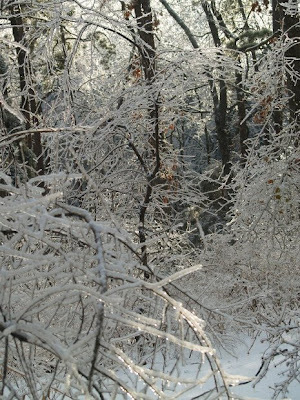 The forest around our home has the unusual sound of trees being ripped apart by the weight of ice. We have had limbs falling nearby and on the deck but so far no major damage has been done to the house. I spent part of the morning and part of the afternoon clearing downed trees and very low hanging branches from our long gravel road. There are aspects to this kind of thing that one learns to cherish. We will be very glad when the power goes on, but living without requires a different level of consciousness and greater attention to planning and preparation. For instance, my wife Jean began working on our dinner of Pasta Primavera before dark, while we still had a bit of outdoor light coming in the windows. We have candles in strategic points to help our navigation through the house. We have a supply of wood laid in alongside the wood stove which I have kept blazing all day. The dog is nested in the warmth of the breakfast room, and I am doing just a bit of correspondence before the battery is finished on the laptop. Do you all know how precious a thing life is? And that it is made better when the hands are engaged in making it so? 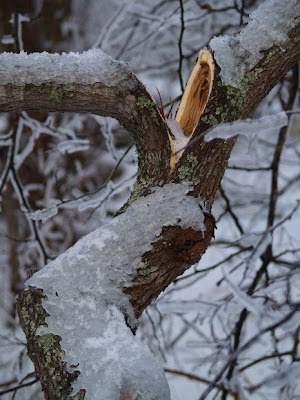 Our power outage may last days, as the damage to trees from ice is very widespread. But joy and peace are not dependent on getting power from the grid, and today has been a pleasant reminder. The tendency of modern systems of education is toward a proper distribution of practical with theoretical training. The mind is to be aided in its development by the action of the eye and hand; and, in fact, all the special senses are employed in objective teaching and manual exercises. In school, the eye does more than interpret the printed page: it recognizes the form and color of objects, it must calculate their size, proportion, and distance, by observing and comparing them; the hand is required to do more than writing: it is taught to appreciate the weight, hardness, and other properties of objects, by actual contact with them. At first the introduction of drawing, modeling, and the use of tools, into the courses of study was experimental; but, having passed beyond that stage, these exercises are now known to be efficient aids to a more natural and rapid as well as stronger mental development. There are some who, after being educated in the abstract way, can apply their training successfully to practical pursuits, who see no necessity for manual or industrial training in the schools, and who claim that superior and sufficient development may be obtained by the study of mercantile methods and the classics. These, however, form a very small percentage of the people, and systems of education must be arranged to stimulate all intellects, and not measured by the accomplishments of a few. Our best educators recognize this fact, and are modifying old systems by the greater introduction of manual elements. No one doubts the value of practical qualities, not only in ordinary people, but also in prominent leaders, who must be thoroughly practical - a fact so aptly illustrated by prosperous manufacturers and merchants, successful engineers, great generals, and eminent statesmen. This morning, Michael Thain promised to reimburse the 1.2 million dollars used to decorate his office at Merrill Lynch, but made no apologies for the billions in bonuses passed out by his failing company... bonuses paid at taxpayer expense. It is too bad that manual training with the values it imparts in the lives of kids... to be thrifty, industrious, and caring in one's work, to be thoughtful of others, and to have an aesthetic vision in which one takes on the challenge of personal creativity, had so completely disappeared in the 120 year interim between 1889 and 2009. Michael Thain might have received the benefits of its effect, and the decline on Wall Street would not be so severe, nor its effects so deep. We have created a class of ethically impaired managers of American industry and economy who seem to know nothing about either. "It is not equitable that what one man hath done for the public should discharge another of what it has a right to expect from him; For one, standing indebted in himself to society, cannot substitute anything in the room of his personal service. The father cannot transmit to his son the right of being useless to his fellow-creatures. As has been mentioned before in the blog, education should proceed from the concrete to the abstract and back as children express abstract concepts in concrete form. I can think of no better example to illustrate this than the first and second grade classroom at Clear Spring School. As you know, the first and second grade students have been studying native Americans, and building representations of their lives and utilizing their crafts to come to a deeper level of understanding. What you see in the photos above, are their concrete expressions of learning, weavings from the southwest, teepees from the plains, and each object represents hours of study in concrete form. Tomorrow, if the weather holds they will add one more example of Native American culture to their studies, that of the people of the Pacific Northwest. We will make a totem pole. "Theoretical and practical work should, as far as possible, bear one another out. On the one hand natural science, mathematics, history, geography and drawing should offer problems to the shop, and on the other hand, the practical experiences gathered in the manual work should make book lessons the more easily learned." We are expecting a major ice storm in Arkansas that may likely close schools for a day or more this week. But today in the wood shop I have prep work for classes anyway. The first and second grade students will begin making a totem pole, each making an animal of his or her choice which will interlock with others to create a monument of this year's study. It will be a small one. The 3rd and 4th grade students will begin making models of the solar system. I have a model from years past to use as a guide in preparing parts. The 5th and 6th grades are still working on puppets, so I have very little to do to be prepared for that class. The seventh and eight grade students are beginning to make some book holders based on a project I did a couple years ago for publication in Woodwork Magazine. And last, but not least, the high school students are building a boat. That sounds like a lot to keep up with, but by doing one thing at a time, things fall into place and each project, being physical, has a memory of its own, informing me which thing must be done next. The answer to that question should be fairly clear to the readers of this blog. "But, say the advocates of book education, young children are unable to do anything in the manual arts and domestic science that is really worth while. They cannot be expected to have sufficient knowledge of materials, control of tools and of processes to produce things of real value. In many cases, measured by adult standards, that may be true. But that is not the point of view here urged. The aim of this work in the schools is the development of efficient boys and girls, not the production of tables and tabourets, of pies and pinafores. 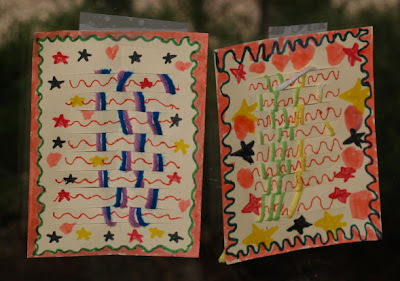 The best teachers of drawing in elementary schools have long since repudiated the idea that their aim is that their pupils shall produce works of art. They aim to give training in expression through lines, light and shade and colors to develop a sense for good form and proportion, for harmony in color, and an appreciation of what is good in industrial design. So in all our schoolwork, it is not what the child produces that is the real aim of the school, but the effect of the effort upon the learner, the development of an appreciation of real values, and of the power to control those values. Hence it is of supreme importance that the work undertaken should seem of real value to the child. And it is with this condition distinctly understood that training in manual arts and industries is urged as of supreme importance for children from seven to twelve years of age." A friend of mine, Elliot Washor, along with Dennis Littky, is co-founder of the Met School in Providence, RI and the Big Picture Company which allows high school students to design their own curriculum. The idea is that if learning is firmly rooted in the interests of the child, each will stay in school long enough to graduate and be well prepared for a productive future. It is a profound concept, and one which I was privileged to see in action a few years back. But simple as it may seem, building a culture of learning is not easy. Part of the challenge Big Picture Schools face is that by the time students reach the high school level, so many are alienated from the process of schooling. It often takes a student's first year in a Big Picture School to overcome his or her adversarial relationship to teachers and education. At some point in the future, we will have more schools like Clear Spring in which students stay engaged in learning from the earliest years through graduation and beyond. Those students will be well prepared to design their own educational processes as life-long learners. But if you are a parent whose child has begun to suffer from alienation in school, check out the Big Picture Company and support what they are trying to do for education. I had a conversation with a friend yesterday, an accomplished potter and woodworker who has combined his two skills and aesthetic vision into beautifully crafted sculpture. He says that there is a serious decline in sales in the world of the arts. Sales at craft shows are down. Sales in galleries are down. Some small galleries are going out of business. When a gallery goes down the artists they represent are hurt. Their incomes plummet. In a small town like Eureka Springs where we have more artists than other professionals, the loss of income effects many other small businesses as well. My friend is turning his attention to making smaller things that can be sold at a lower price. We think of the artist's work as being the making of the objects they sell. And yet the objects are mere symbols of creative process. The artist, when he (or she) is truly engaged in art, and not just the unconscious replication of earlier work, is performing a role in society that lifts it to new levels of consciousness, deepens our understanding of material and design, and brings other elements of societal concern into clearer focus. I could go a bit deeper in this with examples, but know that you will come up with your own. There is another possibility, beyond cheapening works and lowering the price of objects to boost sales through lean times. It is the process of teaching others to create. It is the greater work, and is filled with opportunity for personal creative exploration. It is challenging, but offers great rewards. I have heard very little more said of Obama's "Artist Corp", and I have hopes it will not be forgotten. The best bailout for the arts will come when more and more artists and musicians are empowered to take their rightful places in schools across this land to share their creative energies with our children, and when art and craft schools like Penland, Arrowmont, and ESSA are better empowered to serve those adults hoping to rediscover the creative capacity of their own hands. I had a very good friend, Louis Freund, who was an artist, painting murals in post offices for the WPA during the "great depression." The work he did then shaped his life as an arts educator. He and his wife Elsie left an important legacy here in my town, through their ceaseless advocacy of historic preservation and the arts. We are facing challenging times. And we are ready for a rebirth of arts education in America. The thing that few seem to know in schools today and that we have the responsibility to tell is that arts and crafts and other work of the hands including music have the potential to lift the whole of American education to a new level. As is often said, the Chinese symbol for crisis and opportunity are the same, and renewal of education in America is the silver lining to the dark clouds on the economic horizon. But we all need to work hard to make this story come true. Michael Kaiser, President of the Kennedy Center for Performing Arts tells that arts organizations are endangered by the current economy, but the government is unlikely to do anything about it. We can save Merrill Lynch and its greedy and morally bankrupt CEO, but what about the arts that express the heart and soul of our nation? Michael Kaiser asks, "As we print billions of dollars in bailout money, isn't it time to ensure that we are saving our soul as well as our economy?" This is just a bit more from Mrs. Ida Hood Clark, reminding that there were those, even in the earliest days of public education that gave deep consideration to the full development of each child. "That the present course in our public schools is not sufficient to meet the demands of the times, is very evident. We need one that shall recognize the principles and ideals of this new education, one that will be in accord with our accepted philosophy of life, and one that shall satisfy the social and ethical ideals of the heart. Psychology provides that hand work is the strongest force in the primary grades. If this be true, then social occupations should be used as a center of our course of study and all the other subjects of the curriculum be grouped about them." "It is not necessary to remind those who have given attention to the subject of education how important the influence of the beautiful is, in refining the sentiments and elevating the nature of the young. Let them model a leaf, a vase, a hand, a head, here we have the same advantage as in the making of a box--the object is concrete and therefore suitable for minds incapable of abstractions. What child is not happy if he has produced something tangible as the outcome of his own activity, especially if it is something beautiful. Then, too, he has learned to be exact--that is, truthful in his work and he will be inclined to be truthful in his thoughts. Children may be trained to detect beauty when they see it, and they will never be sure that they see correctly until they attempt to translate their impressions into actual form. So to appreciate what is beautiful, let them make things that are beautiful. If we all work together in this spirit, then the early years of childhood would be given to manual training enlarged into faculty training. Knowledge may be better than riches, but children are not able to use either if the knowledge is second hand. Children have an immense appetite for the concrete world, but they are satisfied with a very small reasoning of the abstract." So how long has it been since you heard an educator speaking of the heart, or of beauty as a necessity in the education of our children? We have become far too focused on efficiency and economy in schools and it is time now to make a greater investment in education. Mrs. Ida Hood Clark was the supervisor of manual training in the Milwaukee Public Schools and this is quoted from her presentation to the Eastern Manual Training Association conference, 1905. Think of this as a prescription for what ails us in education today. "...it is a poor education that does not teach our boys and girls to walk and run, skate and swim, ride and row, throw and jump, for upon these physical powers joy and health and life depend much more than such formal studies as arithmetic. "So this bodily or physical culture has an assured place in this reasonable curriculum which fails signally if it does not produce vigorous bodies, and warm hearts just as surely as informed minds. So connect manual training with a movement for larger school houses, less number of pupils to a teacher, ampler play grounds, suitable physical culture gymnasiums, and you will transform the children into taller, larger, stronger men and women to whom useful toil will be a joy. "I need not speak of the value of manual training to the artisan class, nor of its value to the future surgeon, scientist and all whose avocation requires deftness of hand, but I do wish to speak of its value to the future lawyer and clergyman. Just because they will not be called upon to labor with their hands is it so important to them in the interest of an all around culture, in order that they will not be entirely crippled on one side of their nature." This was written before the rising of the business class in the American economy... before number crunchers, CFOs and CEOs. If Mrs. Clark were writing today, these and politicos would be on her list, urgently requiring education of their hands. And who would have guessed that these being so crippled would cripple our economy as well? So, how do we move from what we have now to the more idealized education Mrs. Clark recommends? She prescribed an answer for that as well. According to Freidrich Froebel, inventor of Kindergarten, education is a two way street. Through "self-activity" the pupil explores and expresses in equal measure. 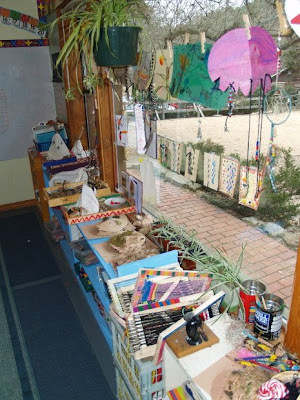 Through the "gifts" Froebel designed, students were offered a means to systematically explore physical reality, and through the associated "occupations," students were encouraged to express their learning in an outward and creative manner. Crafts and manual arts were the ideal means through which to express learning. So, rather than adding manual training as one more layer in an already crowded curriculum, Mrs. Clark (and many others) proposed manual training as the means through which every subject could be integrated, or "correlated" using the term then in use, and brought to greater meaning and life. 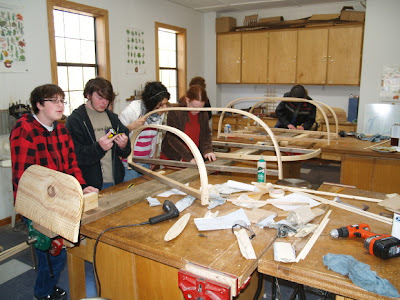 She provided examples of how this was to be done, but if you want to see a living example in this time, in which history, mathematics, chemistry, social studies, language, and the arts form an integrated whole, plan a visit to the Clear Spring School woodshop. John Thain former CEO of Merrill Lynch spent over a million dollars decorating his office as employees were being laid off and the company was facing billion dollar losses. In addition he paid out 3-4 Billion in bonuses on Dec. 29 just prior to Merrill Lynch's takeover by Bank of America, forcing the bank to request an additional 20 Billion in federal bailout money. People spend years in jail for shop-lifting at Walmart, but the theft of billions from the American taxpayer will likely go unpunished. Is it clear to my readers that having no grasp of reality is commonly explained in terms of the hand? Out of touch! Educational Sloyd had as one of its main objectives, the shaping of the child's personal integrity and character so that he or she might become a constructive member of society. There are important values to be learned and discovered through creative craftsmanship. Even the children of the rich and famous can learn important lessons from working with their hands in the service of others, so sloyd was proposed as a component of every child's education. Sloyd was a popular method in the early days of the 1900's, so its demise left plenty of time to develop selfish idiocy in the top tiers of American business, and the dramatic decline in the American economy is the direct result. Take the hands out of learning, remove skill and craftsmanship from schooling, ignore the cultivation of essential human values, leaving the kids out of touch, and guess what you get? In the meantime we do need to have children engaged in hands-on learning, so they, unlike the current crop of Wall Street CEOs will not be so far out of touch. Ironically, John Thain was the one in the news earlier in the year for proposing to the Merrill Lynch board that they award him with his own 10 Million dollar bonus. The board balked. He was shamed and withdrew his request. Now for him to have passed out 3-4 Billion in bonuses to staff that could only have come through federal bailout money should be cause for investigation, and hopefully prosecution. Whether John Thain consciously sought the position of poster boy for the greed and arrogance hall of fame or not, it seems he is running neck and neck with Ponzi artist Bernie Madoff as this year's leading nominee. We began placing the ribs for the boat in position on a board that serves to hold the parts in place as the boat is assembled. We calculated the volume and approximate load capacity to see if it will indeed be capable of carrying the whole class. So far, so good. Next week we add the gunwales, keel and some strips to hold the ribs permanently in place. I have been thinking lately of Herman Hesse's book Siddhartha written about the life of the Buddha, and the line that stuck for all these years is when Siddhartha as a young man was asked what his qualifications were for employment. "I can think, and I can fast." Siddhartha responded. He had lived his life as a beggar and monk, and of course, those are the qualifications of a saint. So when our children go to apply for employment, they can say,"I can't play guitar, but I am good at guitar hero!" Or they can say, "I wii!" We can hope that their first employers are wise enough to see beyond their self-imposed limitations. Siddhartha is available on Google Books. In the photo above, you see the boat beginning to take shape. 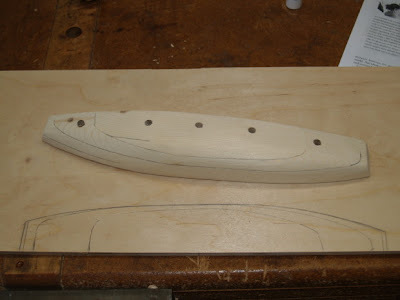 Tomorrow the kids and I will add stem and stern panels, the gunwales and keel and begin adding strips running end to end. Once those are in place, we will add additional ribs. As computers become more intuitive and responsive, requiring less and less skill to operate, they require less education to use and provide less educational value in their use, but parents are of course worried that if kids don't start on laptops at the earliest age possible, they will be left behind. Here are some simple skills that all kids need and regardless of changing circumstances will always need that they won't learn by sitting at laptops. 1. Get along with each other. 2. Manipulate and explore the materials and relationships in the real world. 3. Do stuff, make stuff, fix things. 5. Learn the interpersonal skills necessary to lead others. Can it be that any of these skills are equal in importance to being able to game and to google? You will note in the article that the push for kids is really about increasing chip sales, and insuring a whole new generation of consumers for Intel products. Who cares if we are smart as long as we consume? Mindlessly, right? (Howard) Gardner believes craft education is particularly conducive to the development of bodily kinesthetic knowledge because it is so intimately tied to labor (doing) and the physical handling of materials and it demands exceptional motor control. Of particular importance for our findings about the low status of craft education is his observation that Western civilization falsely privileges linguistic and mathematical intelligences (probably because they are most useful in business, war making and academic careerism). Whenever these two forms of intelligence are used to predict success and failure, he notes that bodily skills become relegated to the lowest levels of the hierarchy. An interesting thing to note is that as I have mentioned before, nearly every kind of intelligence can be utilized and explored through experience in the school wood shop. And we all know that academic knowledge is most highly valued over skilled accomplishments in physical reality by idiots. Mason and Houghton call on the work of Schon and Sternberg & Caruso to support their conclusion that knowledge is gained through working with the hands and that practical knowledge helps in making decisions. Their conclusion affirms what Finnish Department of education Official Takala said, "You learn to think using your hands and you go deeper in your brain." It seems unnecessary to say that this dimension of craft education should not be lost, and moreover, that it should be further researched and appreciated in the hierarchies of what is valued as learning in schools. The funny thing, of course, is that those who work with their hands know the truth of this, but many who don't would never find the evidence or discussion to be meaningful enough to make necessary changes in education. 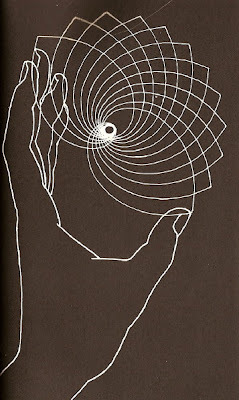 We are either open and observant of the intellectual dimensions of our hands, or we are not. So, of course we are singing to the choir. But if more and more people become observant of their hands and appreciative of their contributions to learning and intelligence, we will make changes in education. Our children will be wiser, more intelligent and happier when we give their hands greater exercise in learning and making. Making is inherently pleasurable in itself and a critically important biological drive... the pleasure children experience in handling and crafting physical materials is inextricably linked to the tool making and ceremonial (artistic) functions of human activity that play an essential part in human evolutionary development and are crucial to human survival. This quoted from a paper by Elizabeth Garber, "Craft Education in Finland". which can be downloaded in full as a .pdf file. One of the things you learn in wood shop is that work with the hands requires intelligence, too, and those who work with their hands are deserving of the same level of respect within society as those who work exclusively in their heads. Our economic structure doesn't reflect that, does it? If you are a CEO of a major American corporation, your salary will likely be 350 times the level of your average employee. And there is shame to be found in that... Selfishness and greed belonging to a past presidential administration in which those things were to be applauded and encouraged in lieu of service to our nation. I am impressed with the words of Obama. He is an eloquent speaker, and I wish I could be there with my daughter tomorrow for the Inauguration and to hear his words in person. Instead, I'll very likely watch in my living room, surrounded by students from Clear Spring School. After all, leaders should be chosen for young people and those yet to be born, not to serve only those whose lives are already safely and firmly established. And I have been so pleased to see how Barack Obama pulled so many young people into the democratic process. It is gratifying to see young people as enthusiastic about the political process as I was in my early years. We have been missing the long view. Our corporations look to the next quarter, our families look to the next paycheck or the next tank of gas. I have confidence that Barack Obama is one who thinks of his children and their children... not just how we will cope with the next few months, but how we will build a society that is more just and that represents the aspirations and capacities of all people. One of the things I like best is his call that we each dedicate ourselves in greater service, not to self, but to others and society. Responding to "Our higher angels." He asks that we may be greater and more meaningful to each other than we had been led to believe possible. I wish I could speak as eloquently as he does about all this. But instead, I urge my readers throughout the world, to listen to his words, take them to heart. Somewhere in it all, I expect to hear the hands mentioned, that they not be left idle. They are an inseparable element of human life, service and culture. We will surely be better off when the hands receive their fair share of attention in our nation's schools. I am talking about art, music, gardening, cooking and wood shop and the caring for each other that arises when our hands have awakened our hearts to greater service. Today, when I went to the wood shop to do prep work for tomorrow's classes, I found the building to be flooded by a burst pipe. Only the wood shop was spared from the deluge. So I have canceled classes for tomorrow while pipes are repaired and thousands of gallons of water are pulled from the carpet in the adjoining rooms. There is a national trend to reduce or cut recess for children to make more instruction time available for passing standardized tests. This is in direct opposition to what is widely known about child development. Children in schools need unstructured time to reflect, to test on their own, and to work out relations and rules with their peers. Plus, recess is nearly every child's favorite time in school. At Clear Spring School we have been doing classroom visitations, providing each teacher time to visit the classrooms of our peers and to commendations and recommendations on how we meet the mission of hands-on, hearts-engaged learning. 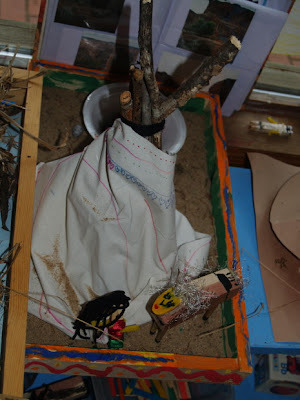 This is a mission that is easiest to meet at the lower grades where lessons tend to be more concrete, involving craft materials and hands-on manipulation of objects. It becomes more challenging at the upper levels of education where learning becomes more abstract. Schools are never a set point in time, but a process of evolution toward goals that better serve the learning needs of children in flux. Too often, teachers work in isolation in their own classrooms and our visitation have been useful in moving toward better implementation of a shared vision. If you plan a visit to Clear Spring School (and visitors are welcome), plan to be on campus at 10 AM. Recess. It is when you will see all the Clear Spring School students engaged in cooperative play. And it is a time when you will see how important recess can be in the lives of children. It is obvious that whatever place is given to manual training in the primary curriculum will depend upon the view one takes of the aim of education. Unquestionably the present tendency is to view education from the social point of view. The individual is to be developed, not for his own good, but for the good of society. The great problem of the twentieth century is the reconciliation of individualism and socialism. We are led to adopt the social view of education, because we cannot think of an individual merely as an individual, merely as living unto himself. Therefore, we may define the aim of education to be to enable the child to so adjust himself to his environment, that he may become an efficient member of society. I have not the time in this connection to explain fully the content of the term efficiency; but one of its most striking aspects, as the etymology of the word implies, is the ability to accomplish something. It does not mean mere book learning, but implies the possession of a kind of knowledge that readily passes over into action. With this as the general aim of education the practical problem for the teacher is how to bring it about. He has as the raw material the fundamental instincts and interests of the child, and he has in the school the means of realizing this aim through them. Now this school life must be real and vital to the child. It must be for him genuine social experience, of such a kind that he will gradually come to understand the civilization of which he is a part. In such a view of education manual training has its place. Through its activities manual training, more than any other subject, may help the child to understand the material aspects of present civilization, and will be of incalculable value in giving to the child that point of view that will make all of his knowledge efficient. This is then, in my mind, the chief function of manual expression in the primary curriculum- it is a potent means of interpreting to the child his environment. This does not deny to manual training the advantages that its advocates claimed for a number of years, viz., mental training, respect for honest toil, honest expression of the child's endeavor, skill in handicraft, etc. Manual training may be of value to the pupil in all of these respects, and yet perform its chief function that has been mentioned above. Today my daughter Lucy is on her way to the Inauguration and we are very excited for her, being there at such a great moment in history. George W. Bush's failures should not rest on his shoulders alone, but in the hands of each person who voted to place him in an office so far beyond his intellectual and moral capacity. I don't see anyone lining up to acknowledge their serious errors of judgment, but perhaps they are in a state of shock and denial. We have paid a tremendous price and will continue to pay as a nation for his failings in every possible direction. As a woodworker, I am interested in a restoration of strength to our economy. As an environmentalist, I am interested in seeing our planet's diverse species protected and our responsibilities to the preservation of the Earth's climate met in full. As a teacher, I am interested in seeing a renewal of sound educational principles, particularly recognizing the value of real hands-on learning for all children. As a human being, I am interested in seeing a restoration of values, not the empty slogans of "Compassionate Conservatism", but of action toward renewal of communities and opportunities, of volunteerism and personal investment in the lives of others. It would be naive to think that such changes can come easily and without effort. We have work to do. Yesterday President-Elect Obama left Philadelphia by train on his journey to Washington, DC. Thousands of people lined the tracks in hopes of catching a glimpse of our new president. I congratulate you on your assemblage here at your eleventh annual convention; and I am most happy to welcome you to this city of Philadelphia. It seems to me that manual training is becoming the most popular feature of our system of education. I am quite sure that a man who graduates from a manual training school is better fitted for the battle of life than the man who graduates from the school that has not the manual training in its curriculum. What the world wants today is the man that does things; what it wants is the man that can do things, rather than the man who graduates from a school with a dogma or a theory. What the world wants is the man who graduates from the manual training school--who can do things and who is always constructive and not destructive. I am so pleased with the end of George W. Bush's second term. It is past time for the end of dogma, and the restoration of practicality and action-- In schools, in the preservation of our environment, in the use of American power and diplomacy, and in our own lives, as we take charge and gain through our own hands, the power to live better, more meaningful lives in service to ourselves, our families and our neighbors. I am very proud of my daughter Lucy. She will be there as history is made on Tuesday's Inauguration of President Barack Obama. Tomorrow, Dr. Martin Luther King day has been called as a national day of service by the incoming Obama administration. There are millions of people who already live each day called to service. For those, this will be nothing new. But there are many who act as though their sole mission in life is the generation of resources for their own personal consumption. Today's Arkansas Democrat Gazette Newspaper listed the state's highest paid employees. Is it any surprise that the highest paid government employees in the state of Arkansas are the athletic coaches from the University of Arkansas? With a very slight shift in American values there could be a sense of shame applied to those who require such huge compensation for something that could be a matter of service, selfless giving and heart. And of course, one might ask, what kind of example do these coaches set for our kids? You can purchase my DVD Basic Box Making as a video download for $14.95. It plays on any computer and contains 2 hours and 30 minutes of step-by-step box making tips and instruction. Click the photo to begin your purchase or to get more information. The annual Marc Adams School of Woodworking catalog has come out and can be found online here. Marc notes in his letter confirming my classes in August that acres of trees can be saved if students rely on the on-line catalog rather than requiring a print version. So, please use the on-line catalog and register on-line. 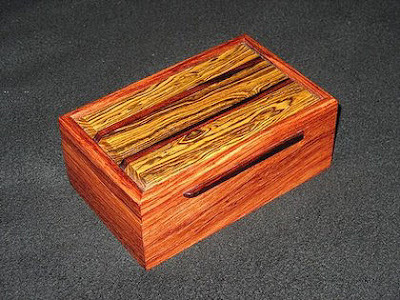 There are currently only 4 or 5 spaces available in my August class, so if you are interested in taking a class in box making, please don't delay. This morning, I am attending the blog and waiting on cornbread to come from the oven. I have about 15 more minutes to wait. I had a choice this morning whether to make cornbread from scratch or from the already packaged and measured corn meal mix. And I chose the mix for convenience and we had it on hand. When you have lots of specific ingredients to add, it is easy for something to go wrong, and I remember my earliest days of cooking. I would come home from school and stir up a package of Jiffy cornbread mix, and put it in the oven for a snack. It helped me to develop a love for cooking and confidence in the kitchen. Now, think of Howard Gardner's Multiple Intelligences as a recipe for success in the education. There are 8 essential ingredients as described in yesterday's post. Most of these ingredients are unfamiliar to most university trained educators. Eight ingredients is a lot to measure. If certain ingredients are left out, the whole batch of kids isn't ruined, but kids here and there that don't fit the more prevalent learning styles end up dropping out. 30%. Others who may make it to graduation, may never have their full intellectual potential stimulated and awakened by their participation in school. 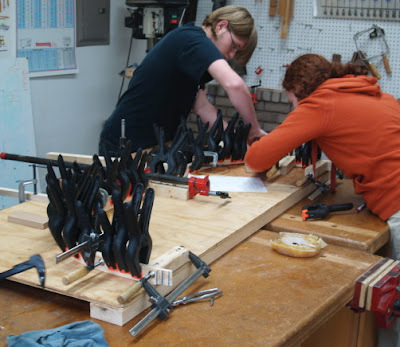 Think of woodshop as a Jiffy cornbread mix of education. It has all the essential ingredients in a package. Add egg and milk. I can smell cornbread in the kitchen. Have a perfect day. Unfortunately, utilizing these in the classroom has been a failure as teachers struggle to find the right dosage of each to meet their student's needs. How does one measure and administer a recipe so complex? And how do teachers administer learning opportunities that they themselves were deprived in the crucial years of their own development? Far simpler is the approach of offering wood shop. In wood shop, you find each of these learning styles and intelligences automatically in use, in just the right dose for each student's display of "intelligence" as students do their math, physics, social studies, reading, development of spatial sense and learn to work effectively with others. Want to hear some music? Give kids saws and hammers. The music is divine. I am up way too early this morning so I can take my daughter Lucy to the airport for her return to Columbia University. Today we began making the ribs for the boat. Seven are required to outline the basic shape and 8 additional ribs will be laminated in place after the keel and gunwales are formed. The photo below shows the half model, tracings of the various layers of it and a table of offsets developed from the tracings. In the table of offsets, the measurements on the right of each set are the distances scaled horizontal from the centerline to the outside of the hull. The measurement at left is scaled from the distance from the top edge to the keel of the model. 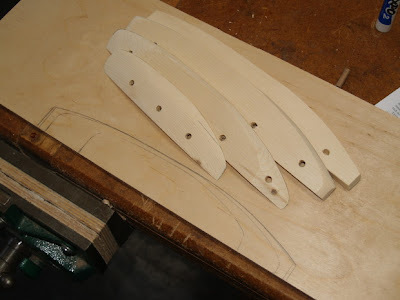 The table of offsets is used to locate the various points in the curvature of the ribs so they can be laminated to the required shape to form the width of the hull. What are "handles" really for? 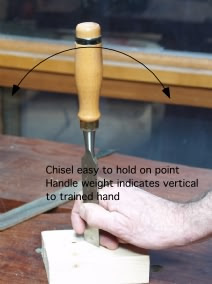 You would think that handles are where you put your hands, but experience with chisels may indicate a different function. 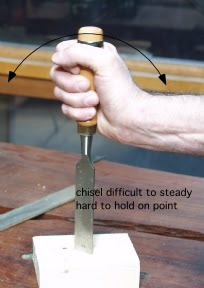 By placing your hand low on the blade you gain better control of the exact position of the tip, your chisel holding hand has the advantage of resting on the working surface, and the handle of the chisel itself functions as a pendulum indicating whether or not the chisel is being held exactly vertical. It is like holding a long pole in your hand. With practice, you can feel with your eyes closed when it is straight up and down. The images at left tell the story. Please don't take my word. Grab a chisel and try this for yourself. One of the very important lessons learned through the acquisition of skilled hands is that you begin looking at your own experience as your source of authority rather than adhering to fanciful beliefs contrived second or third hand by others. One of the things Otto Salomon did in his development of Educational Sloyd was to carefully and objectively observe students and trained craftsmen at work. Usually we work with our hands without paying very much attention to them, but there is a great deal we can learn about the world and ourselves by paying greater attention to our hands. "The conviction is gradually obtaining among the members of the Board of Education [of Philadelphia], and in the public mind, that every child should receive manual training; and that this feature must ultimately be incorporated into the public education. What is this but the realization of the principles which every great thinker in education has insisted upon, from Comenius, Locke, and Rousseau, to Pestalozzi, Froebel and Spencer!" The most striking effects of Manual Training long antedate its introduction to the schools. For thousands of years, in every shop where the humble mechanic wrought; at every fireside where the domestic arts obtained a foothold; in every field where a step forward was made through the invention of some less crude implement of husbandry than the one that preceded it, the mind and the hand expressed their joint struggle towards the achievement of that skill in useful things which constitutes the very kernel of civilization. ...manual training, educationally, is the blending of thought and action. The thought that does not lead to an act is both mentally and materially barren. For as it confers no benefit upon the human race, neither does it profit the mind that conceives it. Nay, more. An unprolific thought exhausts the mind to no purpose, as an unfruitful tree cumbers the ground. It follows that the integrity of the mind can only be maintained by the submission of its immature judgments to the verification of things. Hence the correlation of thoughts and things is as necessary to mental and moral growth as the application of the principles of abstract mechanics to the arts of peace is essential to human progress. The first and 2nd graders made toy horses to go with the Navajo families, stories and dwellings they are making in their classroom. The 3rd and 4th graders are nearly finished with their study of the rain forest, but they ARE studying fractions. So we made fraction blocks for adding and subtracting fractions. The following was sent in by Joe Barry from The Power of Limits: Proportional Harmonies in Nature, Art & Architecture by Gyorgy Doczi. When we share our own limitations with the limitations of others, as we do in the golden relations of neighbors, we complement our own and others' shortcomings, creating thereby living harmony in the art of life, comparable to the harmonies created in music, dance, marble, wood and clay. It is possible to live in this way because the proportions of reciprocal sharing, nature's own golden proportions, are built into our own nature, into our bodies and minds which are, after all, part of nature. The basic pattern-forming processes of nature, which have shaped the human hand and mind, can continue to guide whatever the hand and mind are shaping, when the hand and mind are true to nature. Thus the best human creations are ageless and even holy, like a freshly opened flower. Looking back to where we started, with Buddha holding up a flower we see his hand first in the gesture of teaching (A). As it unfolds, the index finger moves along the same kind of logarithmic spiral that unfolds in the myriad forms of nature (B). The combined movements of all five fingers (C) create a picture of a thousand-petalled lotus, symbol of final attainment and wholeness. But this hand is not only the hand of the Buddha; it is the hand of every human being. "It is truth now universally recognized by educators that ideas are formed in the mind of a child by abstraction and generalization from the facts revealed to him through his senses; that only what he himself has perceived of the visible and tangible properties of things can serve as the basis of thought; and that upon the vividness and completeness of the impressions made upon him by external objects, will depend the clearness of his inferences and the correctness of his judgments. It is equally true, and as generally recognized, that in young children the perceptive faculties are relatively stronger than at any later period, and that while the understanding and reason still sleep, the sensitive mind is receiving those sharp impressions of external things which, held fast by memory, transformed by the imagination, and finally classified and organized through reflection, result in the determination of thought and the formation of character." --Miss S. E. Blow, "the Kindergarten" an address delivered April 3, 1875 before the Normal Teacher's Association at St. Louis, Mo. "We are training no American craftsmen, and unless we devise better methods than the old and now obsolete apprentice system, much of the perfection of our almost automatic mechanism will have been achieved at the cost not only of the manual but also of the mental development of our men. Our almost automatic mills and machine shops will become mental stupefactories." Mr. Edward Atinson "Elementary Intsruction in the Mechanic Arts." 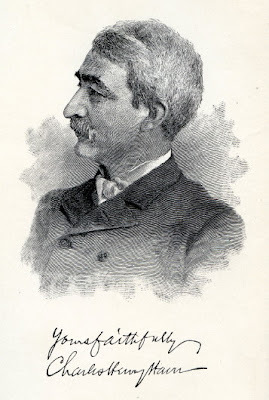 Scribner's Monthly, April 1881. 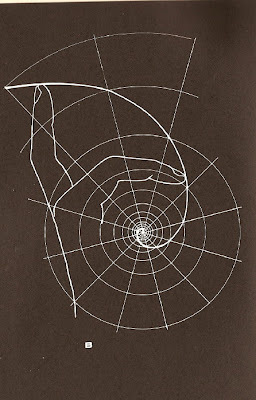 "We rightly seek the meaning of the abstract in the concrete, because we cannot act in relation to the abstract, which is only a representative sign; we must give it a concrete form in order to make it a clear and distinct idea; until we have done so we do not know that we really believe--only believe that we believe it. A truth is best certified to be a truth when we live it and have ceased to talk about it." As long as schools teach purely in the abstract from books or computers, children will have no means of testing the truth or accuracy of the observations of others. If conformity of view and complacency are our educational objectives, we have created the perfect system for them. 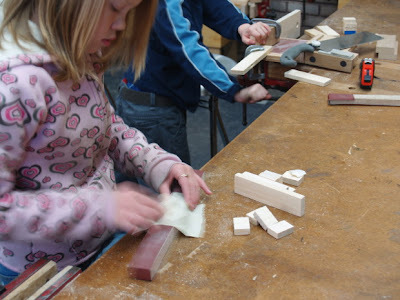 One of Froebel's principles was that students needed to both take in learning and have the opportunity to express it in concrete form... not by taking tests to prove uptake of abstract data, but by creating concrete expressions of learning. Like the objects we make in woodshop. Today I am preparing for tomorrow's classes. In the first and 2nd grades we will be making miniature horses for their Indian encampments. In 3rd and 4th, the students will be working on fractions, by cutting wood into pieces of specified dimensions for use as manipulatives in the adding and subtracting of fractions. Boxes made in an apartment? 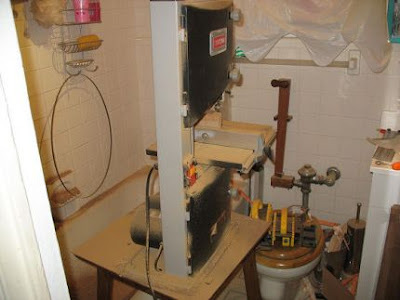 John Grossbohlin sent this link to a Box Maker working in a New York Apartment The photos above are his workshop and one of his boxes. Matt Paldy says of his work, "Woodworking, even in the constraints of the bathroom, gives me an escape from the stress of living in Manhattan. Manhattan is a city that favors disposable items and it's easy to become disconnected from nature, the earth, wood, and the pleasure and appreciation of making something by hand." More of Matt's work can be seen at his WEBSITE. Educating for the exercise of possibility and chaos. The following is from the Danish National Library Authority and is offered in response to Elaine's comments to a previous post. "I wish always to let sense-impressions come before the word, and definite knowledge before judgment. I desire to make the effect of words and talk on the mind of little account, and to secure that dominating influence proper to the actual impressions of physical objects, which forms such a notable protection against mere babble and empty talk. I wish to lead my child, from his earliest development, into the whole circle of nature which surrounds him; I would organize his learning to talk by a collection of nature's products..."
I have been reading a book available on Google Books by Henry Holman called Pestalozzi. Pestalozzi's premise as quoted above was that all abstract learning should be based on concrete experience from the real world and the objects it contains. Words, themselves are abstract representations of concrete objects and experiences. Pestalozzi believed that to express oneself deeply and fully in language was an important goal of education, but he was very clear in his judgment, which should come first. Those of you who have been reading this blog for a long time will know that in a tapestry woven woof on warp the same threads are revealed again and again. It is the same with this blog as I try to move through and expand an important concept. But I hope this post reveals more of the finished cloth. I was reading William Heard Kilpatrick's critique of Froebel, which can be found on Google Books if you are interested in reading along, and wondering why it would be that Kilpatrick, a very strong advocate for Progressive education, would have so little understanding of Froebel's gifts and occupations. I believe some of the answer can be found in my simple chart on the development of knowledge found above. You can know and know nothing to do with your knowledge, and there are things you know and do which cannot be adequately explained on an academic level and yet that in no way denies the usefulness or truth of those things. The failure of Kilpatrick to grasp Froebel's concepts came from his own immersion in explanation rather than action. Academic understanding is only one step in the integration and utilization of knowledge. It would take a craftsman, a cook or a gardener or a musician to explain the difference. The most profound concepts are often hardest to explain and the profound character of Froebel's gifts would be very difficult for those unused to creative manipulation of real materials to understand. It is also most difficult to explain those thoughts and things that are at the cutting edge of development, as were most of Froebel's educational ideas, which were too easily denigrated by those having no actual experience in their use. And many things are better illustrated than explained with words. That's where things like this simple chart come into play.
" Progressive Education: Why It’s Hard to Beat, But Also Hard to Find" By Alfie Kohn was published in the Spring 2008 issue of Independent School and describes the kind of education offered at Clear Spring School for over 30 years. Together, all at Clear Spring School promote a lifelong love of learning through a hands-on and hearts-engaged educational environment. We have become cogs in a machine whirring beyond our consciousness and control, but, what if we wanted to live our lives more fully conscious and awakened to mystery and wonder at the interconnections we have with each other? What would be the nature of the objects that framed that experience? When we picked up a cup to drink, would it be one made through caring investment of human attention, or thoughtlessly and mindlessly cranked out by a machine in a foreign land and delivered through a complex and environmentally destructive mechanism to the local Target Store? Is consciousness something that just happens to us haphazard and regardless, or are there choices we make that affect the depth and quality of our experience? In the US, this rule seems to apply to crafts: the less useful the object, the greater its value... as though crafts, like art are to be placed on shelves and on walls and seen but not felt. And yet it is through the touch and use of an object that its full depth becomes known. In today's world, the deep feelings and sensitivities of the craft maker are kept at arms length. My readers in the US might be interested in visiting the Wharton Esherick Museum where you can find what life was like when all the objects in one's life were made by someone known and those objects were selected for the care and love they express. If we were interested in a more mindful and qualitative existence that engaged our neighbors and friends in greater creativity and the growth of their human potentials, our choices would be very different from those we've made now. 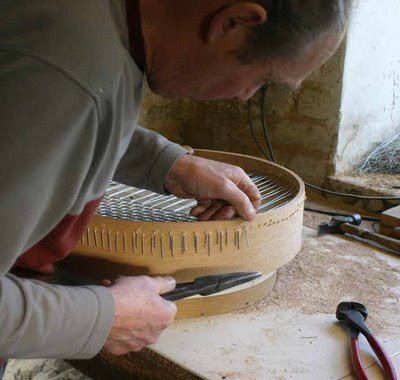 Marcus Sly alerted me to a blog post presenting the need for a new organization in the UK for the protection of traditional crafts. These skills are literally in the hands of the makers, many of whom are old enough to retire and barely making enough income to carry on. Mike Turnock, sieve-maker is shown at work above. Here in the US, we have a wonderful crafts organization, the American Crafts Council. But, little emphasis is placed here on traditional crafts except where those crafts are pushed beyond the traditional limits of the form. So what is often missing in those works is the meditative aspect, the repetitive quality that sets the mind free without effort or struggle. Most academics would regard that as gobbledygook. But what can you do when you are nearly dead from the neck down. 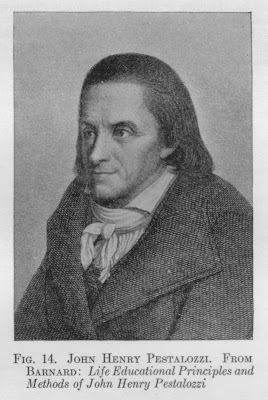 of Friedrich Froebel's contributions to education. While the author, William H. Kilpatrick was glowing in his commendation of some aspects of Froebel's advances in education, he found Froebel's "20 gifts" to be indefensible and of no value. There are tremendous hazards when you take education away from the visionaries and place it solely in the hands of language-centered academics. There are things that can be understood and made useful and yet not be explained sufficiently in words alone. If there had been no Froebel gifts, there would have been no Frank Lloyd Wright nor would Buckminster Fuller's hands have seen beyond his near blindness to create the geodesic dome. 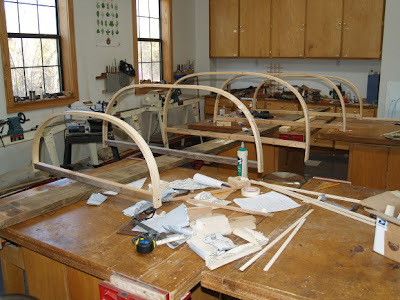 Check out Robin Wood's blog for more on Mike Turnock's sievemaking. It shows a great step-by-step of a too easily lost art. The things of truth always lie with the minority. Emerson said: "One with God is a majority." In your hands, in the hands of the teachers who are working along your line, whether they be manual training teachers or kindergarten teachers, lies a power out of all proportion to your numbers. The work that you do in the schools is the work that draws and that interests and rivets the attention of the students in the schools. Is not that true? You have no trouble to get your children interested in their manual work; therefore your influence with them is tremendous. Now, as an artsman, as one who desires to extend this into life, I have to ask you to go on, not only in your work but in impressing on these people, these young people who when they come into your hands are so plastic, that school is not enough: that it is very well to go out into the world and make beautiful things; that it is very well to go out into the world and make useful things; but that to be worth while in the world they must be makers, they must be creators. This is written by J. R. Heape, J.P. in the Mosely Education Commission Report, 1903. The two pioneer institutions in educational matters are the " Teachers' College," in New York, and " The School of Education," under the general direction of Dr. John Dewey at Chicago, and it is in these institutions that are seen embodied the results of the most advanced thought on educational methods. It is now accepted that the instincts of primitive man are reproduced, and that in a certain definite order, in a child. These instincts have an intense interest for him, and by judiciously utilizing this interest, and letting him deal with elementary concrete facts such as faced his progenitors, a very valuable education is given to him. Dr. Dewey aims at developing and educating the child through what he calls his fourfold interests, " the interest in conversation or communication; in inquiry, or finding out things; in making things, or construction; and in artistic expression: these are, we may say, the natural resources, the un-invested capital, upon the exercise of which depends the active growth of the child." The actual manipulation of material is made most interesting to the child. For instance, preparatory to weaving, raw wool is taken, carded in the primitive manner, span in various ways, dyed by natural dyes which the children gather, and then woven either in small frames, or on a loom which they have constructed. Accompanying all this, very much is done on the art side, where modeling and drawing are looked upon as just as natural modes of expression to a child as is speech. I know this may be boring to most readers, but the rationale for manual training was clearly explored and abandoned in order to make schools more efficient but less meaningful for our kids. The idea was that we only needed a few creative individuals in society, but that we needed a vast number of mindless drones to carry on the labor to sustain the creative elite. But we are working on change. I love this video. It reminds me that what we are doing at Clear Spring School is not new, nor is it out of date. Today, I proposed to our world history students that we build a boat large enough for the entire class (nine students) to go out together on Lake Leatherwood. I asked that they be "on-board" with the project. I volunteered to be safely on shore with the video camera. (just joking) Making boats was what they mentioned would interest them when I asked, and it is the teacher's job to follow interests (where possible, reasonable and safe) to sustain enthusiasm for life long learning. It involves risks. I asked my students, "Do you learn more when things go right or when things fail?" "When things fail!" They said. So, if you are a teacher, you work toward things that push the limits, both for yourself and your students. The photos above show the half model for our boat. 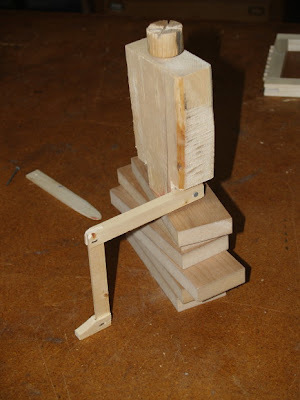 This type of half model is held together by dowels as it is shaped. Then the model can be pealed apart for measuring and put back together to be kept for a later time. If you have half of a perfectly symmetrical object, it carries all the information required for the creation of the whole thing. and the process of creating left from right is an important part of the development of spatial sense. Remember algebra? The left equals the right. In this we are doing math without it seeming so much like math. The best learning times are when things don't work. In designing education for children, both the students and teachers need to be drawn beyond their comfort zones. It's cracking egg time. You can't put things back, but without risk, there is very little growth. And this same thing applies to both student and teacher. I asked the high school world history class about possible woodworking projects that correlate with their study. Several mentioned boats. We have about 5 weeks with one day per week. Can we do it? We don't have the space available. We don't have time. So, aren't those additional reasons to take on the challenge? The photo above is from the last boat inspired project at Clear Spring. 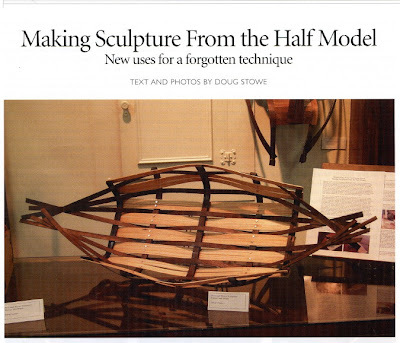 We made sculpture designed from the half-model and the project was featured in Woodwork Magazine, December 2004. Today we begin, knowing that we learn the most when we fail miserably. 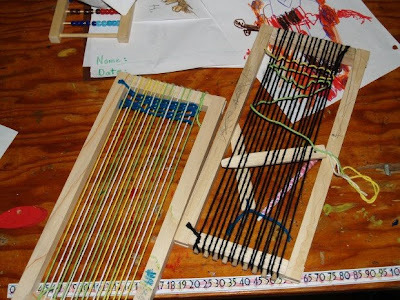 These are first and 2nd grade weavings, done first with paper and yarn and then with the looms we made in wood shop yesterday. The project is done in correlation with study of the Southwest Indians in the US. Today in the 5th and 6th grades we began a new project while some of the students were finishing old. The class is studying anatomy, and of course everything human involves anatomy, in that the scale of things is determined by the fit to the human body. 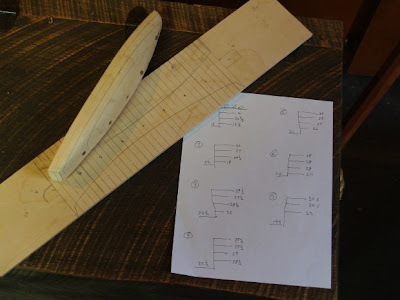 We started with measuring and the charts developed by Drillis, as shown earlier in the blog. 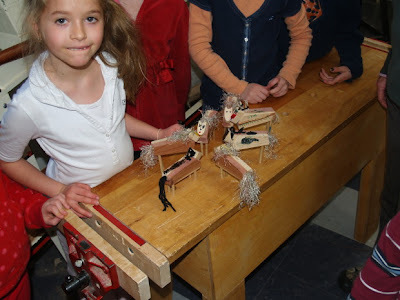 You can see in the model shown in the photo at left, the means that we will use to make puppets exactly proportional to the students in the class. The puppets will be made with bridle joints formed using 1/8 inch thick stock for one part and an 1/8 inch slot cut in the other. A bent nail forms the connecting pin. 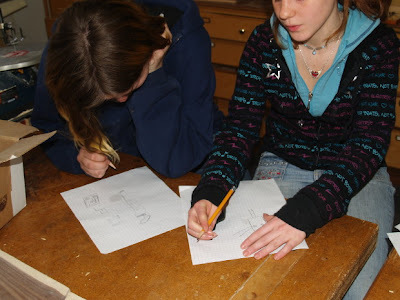 This class we did a lot of measuring and drawing of stick figures and changing from full dimension to 1/4 scale. Did you know that math could be so easily integrated (or correlated) with anatomy and physiology? It can if you have a wood shop. How do we stop duping ourselves? How do we restore direct scientific, experiential engagement with reality? The Zen story of one hand clapping is an example. The teacher asks, "What is the sound of one hand clapping?" And the student runs all over trying to figure it out. Is it like a bell?" he asks. "Is it like a bird in flight?" he asks. And yet a hand passed through the air in direct demonstration would have provided an immediate answer to his quest. We have created schools in which children are pushed immediately into abstraction, causing them to believe that so much is beyond their capacity to understand, so much hidden and obscure and that so many other students are more intelligent or more capable, rather than just more deeply engaged. Once we have accomplished that tragic circumstance, those children are doomed to sit disengaged, bored and feeling incompetent throughout their school careers. Many of the bright ones rebel and become disruptive of the education of others. Throw in a few days absent and a few more tardy, and learning becomes even more abstract. But put the hands in place and things change. When the Mosely Education Commission report found in 1903 that American School success relative to that in the UK was the result of the practicality of our education, and our avoidance of the testing tyranny dominating UK schooling, we were given valuable information which we have proceeded to ignore. So we have students who would not wonder about one hand clapping. They have no enthusiasm for the quest. And the shame of it is that most Americans don't either. We all know we are smarter, and more deeply engaged in learning when our hands are at work. But we seem unwilling to make the commitment it requires. We would rather run all over looking for the sound of one hand clapping. But we can put hands (all of them) back in schools. Today the 5th and 6th grade students will finish their book racks and begin using the wood shop in their study of anatomy. How will they do that? Stay tuned and you will see. Mario, from Buffalo, sent this clip. "Watch the power of music at work. This is just beautiful." We have diminished attention on the arts and music in schools, for what? Points that can be measured on a scale, and real meaning stripped from our children's lives. I am looking forward to the end of the Bush administration. 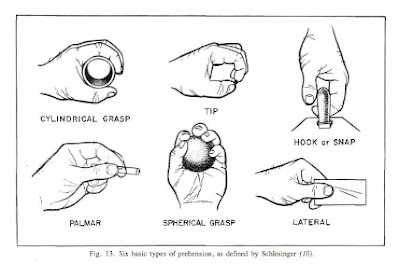 I have published the link to this download before in the blog, but it is an interesting read for those who don't get enough about the hands. Artificial Limbs includes Ethel J. Alpenfels article, "The Anthropology and Social Significance of the Human Hand." let the force be with you? Can the rich amount to anything? A Happy New Year, and give ourselves a hand!